Here are informations about the supported reporters and how you can create your own. The Trial reporters are used to get informations about your tests result. The library comes with a vast collection of reporters, and if none of these suits your needs you can easily add your own. A Reporter is a class that presents some information to the user about a test run. Most of the time the user is a person, but it can be an IDE or a CI too. Because this is an important part of a test run library, you shuld be able to easily extend or create your custom reporters. In order to use the embedded reporters, you have to add them to the reporters list inside your trial.json file. Here is an example. To use it, add spec to the reporters list inisde trial.json. 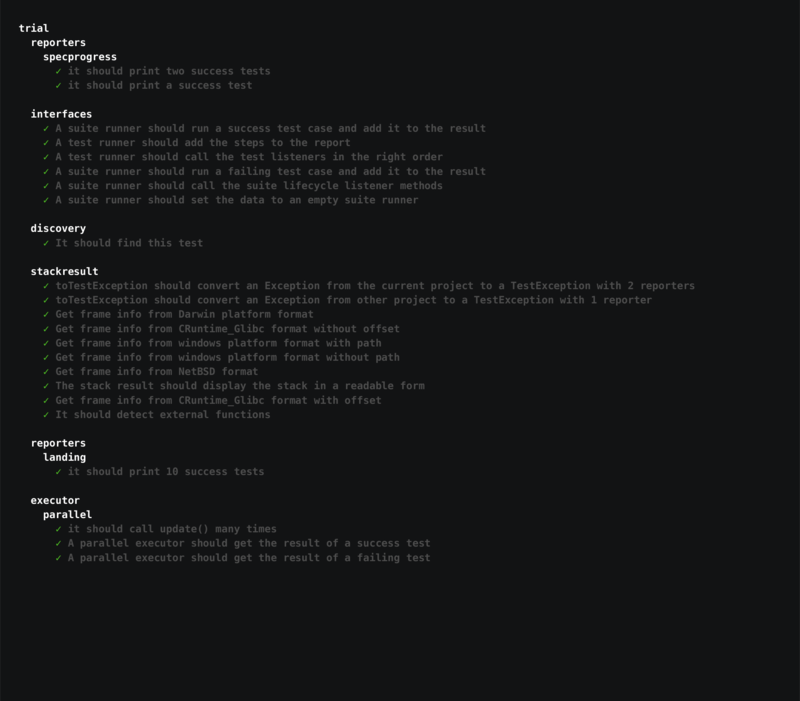 A flavour of the "spec" reporter that show the tests and the steps of your tests. To use it, add spec-steps to the reporters list inisde trial.json. The dot matrix reporter is simply a series of characters which represent test cases. Failures highlight in red exclamation marks (!). Good if you prefer minimal output. To use it, add dot-matrix to the reporters list inisde trial.json. To use it, add landing to the reporters list inisde trial.json. 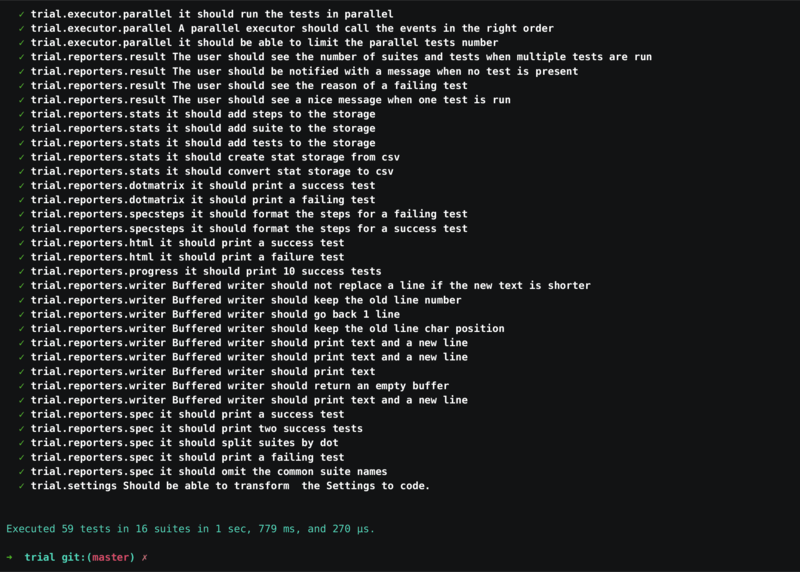 The list reporter outputs a simple specifications list as test cases pass or fail. To use it, add list to the reporters list inisde trial.json. To use it, add progress to the reporters list inisde trial.json. 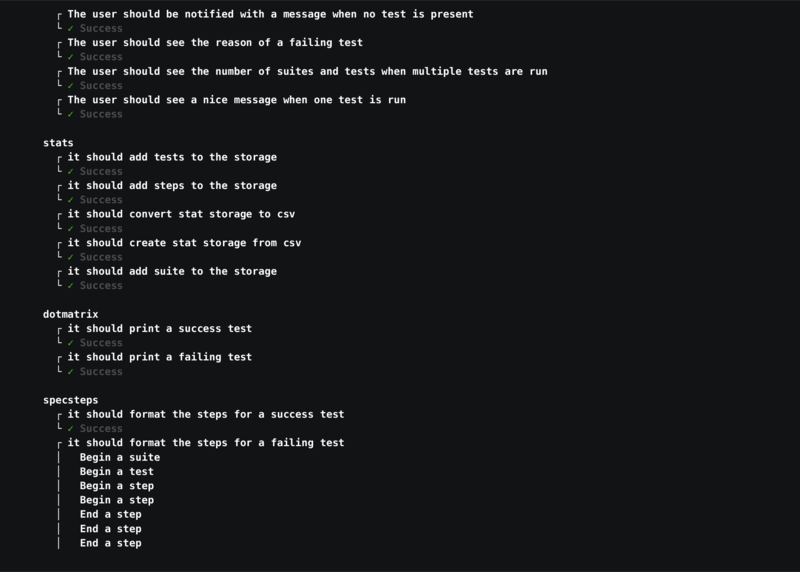 The Result reporter will print an overview of your test run. This is added by default to your reporters list and it's mandatory to use if you want to see the details of the failed tests. To use it, add result to the reporters list inisde trial.json. The HTML reporter outputs a hierarchical HTML body representation of your tests. Just publish it on a webserver and you will have a nice report for your build. To use it, add html to the reporters list inisde trial.json. 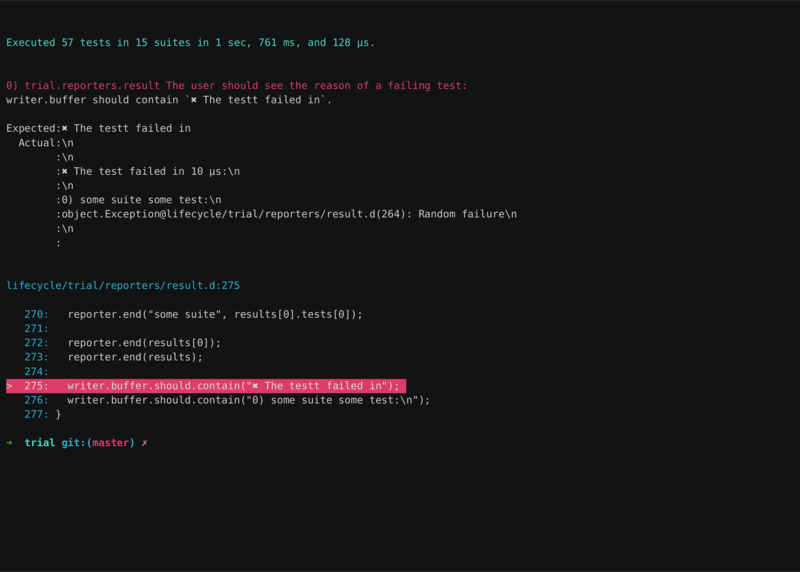 The Allure reporter outputs the test results in an xml file that can be used to generate nice Allure reports. To use it, add allure to the reporters list inisde trial.json. The xunit outputs the results using xml JUnit format. To use it, add xunit to the reporters list inisde trial.json. The stats reporter creates a csv file with the duration and the result of all your steps and tests. It's usefull to use it with other reporters, like spec progress. To use it, add stats to the reporters list inisde trial.json. This is an experimental reporter that extends the Spec reporter. It will display the current running time and the remaining time until the tests are finished. 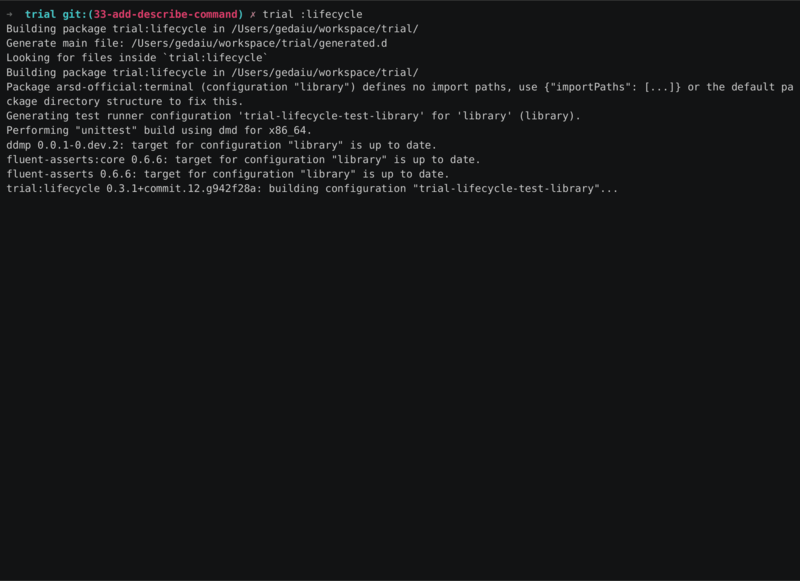 It's recomanded to use it with the parallel executor, when you have tests that take a lot of time, like ui tests written with selenium or appium. To use it, add spec-progress to the reporters list inisde trial.json. If you want to write a custom reporter, have a look at the Lifecycle interface that trial provides and implement the methods that you need.